It was just five short months ago that Canon made one of its biggest statements in years by launching its full-frame mirrorless camera line-up and brand new EOS RF lens line. A whole new format is a big deal for any camera maker. The EOS R, the first camera in this line-up, however, wasn't hotly received on every front. A new layout, new menu system and not all the ultra-high-end features that many enthusiasts and pros had been waiting for left some confounded at what Canon was playing at - especially when Nikon, just weeks before, revealed its duo of Z cameras, with quite a different focus and intent. Canon's response? Sew the stepping stones in 2019 and introduce a lower-spec camera, the EOS RP, with a more DSLR-like layout, in a bid to entice would-be DSLR purchasers over to its mirrorless format. It's cheaper, lighter and will be more familiar for many users - but has Canon lost the plot in what it is trying to do with mirrorless? As one of its statement points the EOS RP is the smallest and lightest full-frame Canon camera body available right now. It's not the lightest ever, though, with that accolade going to the original Sony A7 (back in 2013). Still, that Canon is within grams of that tiny-scale camera just goes to show how the EOS RP has shed a lot of weight compared to the original EOS R (Canon is worried it'll be too small for some, too, as there's an optional grip accessory). Problem is, the RF lenses aren't exactly small-scale optics. Pop one of those on the front and a lot of that weight benefit is negated. We've mainly used the RP with the 35mm RF lens, however, which keeps everything compact and balanced. It's a kit option, too, although given how noisy this macro lens is we're not sure it's the best way to use this camera - and as there's an RF-to-EF lens adapter in the box, you'll be able to use Canon's full EF line-up (ideal if you've had a Canon DSLR before). 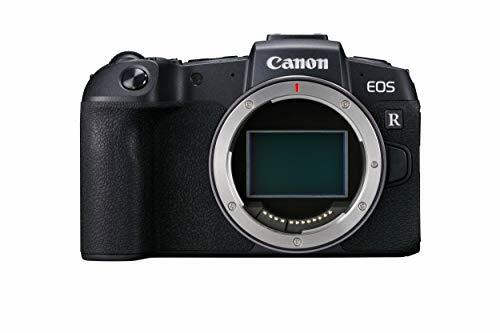 The most obvious aspect of the RP's design is that it looks a lot more like Canon's DSLR cameras: there's a dedicated mode dial, which the EOS R lacks (well, sort of, there's a mode button to be used in conjunction with another dial); and the M-Fn Bar slider control isn't present (as found in the EOS R). That said, the RP lacks any of the complexity you'll find in, say, the 6D Mark II DSLR. The RP doesn't offer dedicated buttons for ISO, metering, drive or AF. There's no top display panel to glance at settings. In a sense, then, the RP is more like an uprated Canon EOS M mirrorless. Which, we think, might backfire on what Canon is trying to do here. The EOS R line-up should be about top-end aspirations, not just about trying to get more customers on board as quickly as possible. However, using the camera is easy enough. The layout feels familiar and easy to make adjustments. The touchscreen is responsive, its vari-angle bracket mount an essential to our way of working. The electronic viewfinder is perfectly fine (like that of the EOS M50) too. And there are plenty of up-to-date features, like Bluetooth and Wi-Fi connectivity. If you've been thinking about full-frame and want it to be affordable and usable in the same sense as a Canon 750D then the EOS RP sits in and around that idea. Performance: A watered-down EOS R? On the performance front we found the EOS R to be a capable system with fast autofocus in a variety of conditions, including low-light situations. The RP is much the same in terms of its effectiveness, but this is very much lens dependent: as the 35mm RF is a macro it's not the fastest at focusing, but great at close-up shots. We prefer the other optics in the range, which are also silent in operation, like many of the EF lenses. There are slight differences between the R and RP: the latter's autofocus area covers 88 per cent of the horizontal sensor space, not the full 100 like the R, which means subjects at the outermost edge of the frame can't be handled for focus in the same way. We don't see that as a big problem and doubt many others will either. The RP has the latest software on board, however, which means its Face-tracking with Eye AF feature can automatically lock onto a subject's eyes when in single or continuous autofocus (servo). Not even the original R offers that in continuous mode, which is great when shooting a moving subject in front of the lens. Using the autofocus is effective with the rear touchscreen in particular - and we suspect this is the way that many will use the camera. The option to drag a focus point around or even pinch to resize it is great for rapid adjustment. Seeing as there's no joystick-style control on the rear of the camera there's not much else of an option - which higher-end users may have otherwise preferred. Video shooting is possible up to 4K resolution at 24/25fps (it's 8-bit 4:2:0 onto the card, for those interested in geek specs) with all the usual controls available. In this Ultra-HD the camera crops into the sensor, giving lenses some magnification overall, whereas Full HD (1080p) shooting uses the full sensor and thus lenses in stills and video present the same focal length. As you can see in the picture above there's 3.5mm headphone out, 3.5mm mic in and HDMI out ports for monitoring and recording respectively. As we've only briefly used the EOS RP at Canon's UK headquarters ahead of the official announcement, we can't give a deep dive into what its resulting image quality will be like. However, as the RP uses the same sensor as Canon's 6D Mark II - well, it's been adapted for the RF mount, so there are minor tweaks - you can expect the image quality to be one and the same. We found that sensor to deliver clean results even in four-figure ISO settings - although it'll go much higher, with ISO 40,000 as standard, and ISO 102,400 available through the extended options. Of course this quality will depend on lens choice, which is a key factor in resulting image quality. It's in lens choice that the EOS R series has one of its greatest benefits too. It's largely been brushed over - probably because of the luke warm EOS R reception - but the quality and sharpness of these lenses and the potential of this mount is undoubtedly great. Yes, the lenses are big and potentially expensive, but this is a full-frame system and that's part of the package. That's a lot of goodness to take on board. But it still makes us think that the EOS R series is crying out for a champion top-spec model. An EOS RX, say? Especially when there are 85mm f/1.2 L lenses being made - that's when pros will be eyeing up what Canon is doing, but not because of the RP camera so much. So does the Canon EOS RP make sense? Well, yes and no. As an overarching way to get more people interested in its full-frame mirrorless line-up at a lighter price point and lighter weight, it ticks the box. But what the R line-up is lacking is an all-singing-all-dancing camera that enthusiasts and pros will want to see - and the forthcoming 2019 lens line-up (as detailed above) looks to nod towards that camera coming - before making their investment. Right now Canon is hanging onto its EF lens heritage as the selling point for its new cameras, as there's an adapter in the box of every EOS RP. That may be the perfect lure for those with such lenses in the bag already, who want a more affordable stepping stone into the mirrorless full-frame market. But in the same breath it's like denying that the RF mount is ready - when that is really this line's big yet understated selling point. And with competition from Sony well established, and now Panasonic and Nikon knocking on the door of this new market in very convincing ways, we think Canon's move to target step-up users is both savvy and overly safe. The RP is a good camera that might get Canon users interested in exploring mirrorless - even if the core high-spending audience will continue to watch events unfold without a distinct interest in this particular product.